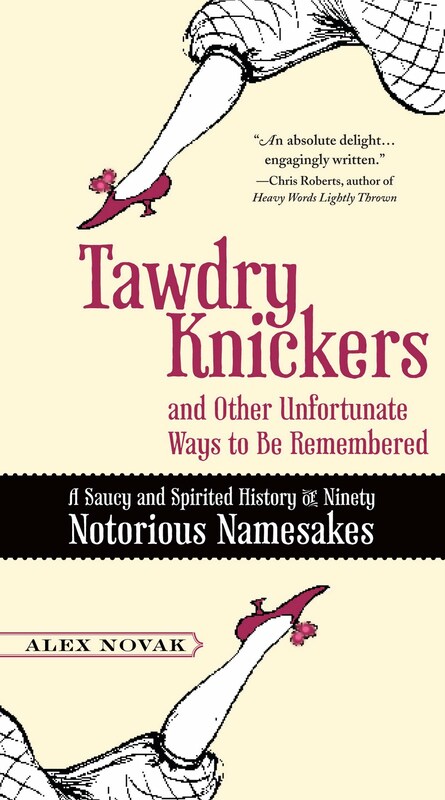 Tawdry Knickers and Other Unfortunate Ways to be Remembered: A Saucy and Spirited History of Ninety Notorious Namesakes is written by Alex Novak, published by Penguin/Perigee, and available from all of your favorite on-line booksellers. 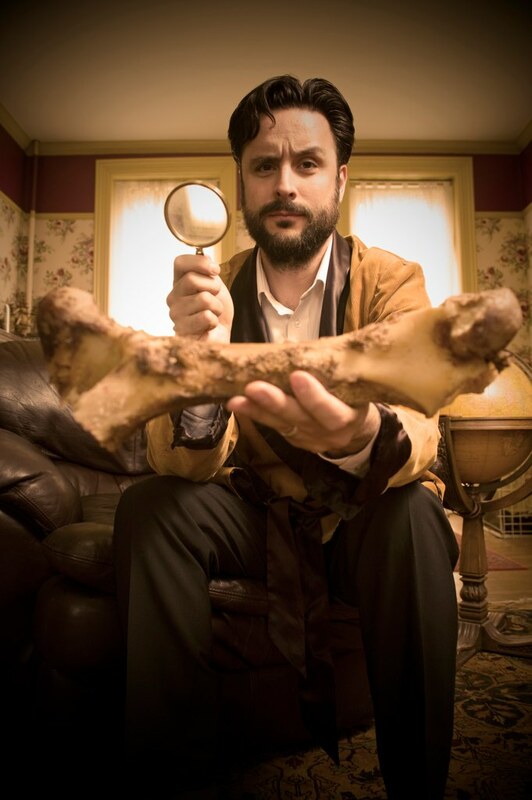 "This is an absolute delight and I'm vexed that I didn't think of the idea, though I doubt I'd have written it up with the wit and verve that Alex has. It's a pleasure to read from start to finish and even the words I knew the origins of are explained with fresh vision and amusing anecdotes. Among old friends like Rachman, Masoch, and Mae West there are the unexpected shockers of people who gave their names to nicotine, knickers, and Listerine. Pleasingly light in tone and engagingly written, this is a very lovely and enjoyable thing." "It's a dirty job but someone's got to do it. In Tawdry Knickers, dozens of notorious characters from history do it—give their names to the English language to enrich it with new words. Alex Novak has done a fine job of bringing them all together in one volume. Engaging reading." "Almost everyone has seen one of those "word a day" calendars, sold with the promise of increasing your vocabulary. By April 1st, you probably look down at it and see that it's still showing February 15th. That's a lot of days you're not going to read through to learn those particular vocabulary builders. Alex Novak however has something very similar, yet very different. Similar in that it's a vocabulary enhancing text, different in that it's fascinating reading that makes you look for opportunities to use the words—although finding a chance to work burke (v. to murder in such a way as to produce no incriminating marks, usually by suffocation, and with the intention of selling the body for dissection) or bishop (v. to murder by drowning) may be a tad difficult unless you're writing a new CSI episode (or planning something nefarious). 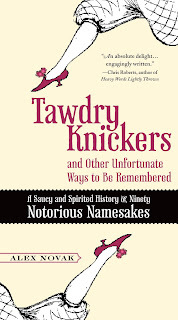 Then of course, there's the title itself, a combination of two words found herein—tawdry (from St. Audrey) and knickers (after Harmen Knickerbocker), not to mention copious trivia about what is and is not the historical legacy of Sir Thomas Crapper—which you only think you know! Tawdry Knickers is bathroom reading of the first water, and yet it's probably one of the most indispensible books you'll want to have on your shelf; after all, every writer worth his salt should novak (v. to make spicy or interesting, particularly in a literary sense) his reference library. I have always loved words and was a spectacular nerd as a child. I have been a writer and editor with the National Geographic Society, Time Warner, and the Explorers Club in New York City. I play bluegrass guitar and mandolin, juggle machetes, ride a unicycle, and spit fire. I received an M.A. in journalism from Indiana University and a B.A. in English and a B.S. in anthropology and human biology from Emory University and have served as an adjunct professor of journalism at Penn State University. I am currently Director of Communications for The Nature Conservancy, headquartered in Charlottesville, Virginia. I have a wife, daughter, and a rotary phone (see Luddite). For more information about me, the site, or the book, e-mail tawdryknickers@gmail.com.